Tapas Kumar Das, Dinesh Jinger and Vijaya Kumar S.
Faulty conventional agricultural practices, particularly, excessive tillage and crop residue burning have substantially degraded the soil resource base with a concomitant reduction in crop production capacity. The emerging issue of global warming coupled with green house gases emissions has further aggravated the scenario. Under conventional agriculture, continued loss of soil has become crucial and critical for global agricultural production. Conservation agriculture (CA) helps in reducing many negative effects of conventional agriculture such as soil erosion, soil organic matter (SOM) decline, water loss, soil physical degradation, and fuel use. CA helps to improve biodiversity in the natural and agro-ecosystems. Complemented by other good agricultural practices (GAPs) including the use of quality seeds, integrated pest, nutrient and water management etc., CA provides a base for sustainable intensification of the agricultural production system. Moreover, the yield levels in CA systems are comparable and even higher than traditional intensive tillage systems with substantially less production costs (Table 1). Recently, ‘controlled traffic’ is loosely presumed as the fourth principle of CA to ensure less or no compaction of soil by the broad wheels/tyres of the tractors. Also, nutrients and weed management sounds equally strong to be other principle of CA. However, a CA system, involving the three major principles is a perfect and true conservation agriculture system, which would be a more sustainable cultivation system for the future. of the Rice-Wheat Consortium for the Indo-Genetic Plains (IGPs), a CGIAR (Consultative Group for International Agricultural Research) initiative in partnership with the national research system of the countries of the region (Bangladesh, India, Nepal and Pakistan) over the past decade or so is now leading to increasing adoption of resource conservation technologies like zero tillage (ZT), mainly for the sowing of wheat crop. In the rice-wheat (RW) areas of South-Asia, no-till sowing of wheat has increased rapidly over the past 5 years with more than 2 M ha reported in the 2004-05 wheat season in the IGPs. In India, efforts to adapt and promote resource conservation technologies have been underway for nearly a decade, but it is only in the past 4-5 years that the technologies are finding rapid acceptance by the farmers growing rice-wheat system in the states of Haryana, Punjab and Western Uttar Pradesh. Efforts to develop and spread CA have been made through the combined efforts of several State Agricultural Universities (SAUs), Institutes of the Indian Council of Agricultural Research (ICAR) and the CGIAR system. Unlike in rest of the world, the spread of these technologies is taking place in the irrigated regions of the IGPs of India where rice-wheat cropping system dominates. CA systems have not been tried or promoted in other major agro-eco regions like rainfed semi-arid tropics, arid regions or mountain agro-ecosystems. The benefits of CA at farmer level could be: reduction in labour, time, & farm power; reduction in cost of cultivation; achieving more stable yields, particularly in dry areas; better traffic ability in fields; gradually increasing yields with decreasing inputs; and increased profit (from the beginning or after few years). The benefits at the global level include: less leaching of soil nutrients or chemicals into ground water; less pollution of water; practically no erosion (erosion is less than soil build-up); re-charge of aquifers through better infiltration; less fuel use in agriculture; and carbon sequestration. The laser-assisted precision land leveling, popularly known as laser land levelling (LLL) is a prerequisite/precursor technology for adopting CA practices like zero tillage, bed planting. It was introduced for the first time in India at farm level in Western Uttar Pradesh during 2001. It provides a very accurate, smooth and properly levelled field, otherwise, crop seed will not be placed at proper depth and germination will not be uniform. Fertilizer and water also will not be uniformly available to crops. Laser land leveling improves crop establishment, increases about 3-4% net cultivable area due to fewer requirements of bunds and channels, can increase water application efficiency by over 50% and water productivity of crops and crops yields by 15-25%, saves approximately 20-25% irrigation water, increases nutrient use efficiency by 15-25% and reduces weed problems and improves weed control efficiency. All these factors lead to about 1-2% increase in yield. Irrigation water reaches to the tail ends of the fields in less time. This technique can be very useful for rice since irrigation water requirement is reduced drastically. A CA-based direct-seeded rice (DSR) with mungbean or other plants residue retention has great potential for minimizing the cost of production, soil health hazards and the negative impacts on the succeeding crops. Besides, CH4 emission is considerably reduced due to DSR in rice-wheat system. DSR avoids water required for puddling and reduces overall water demand compared to transplanted puddled rice (TPR). It saves labour (~40-45%), fuel (55-60%), water (30-40%) and time and gives comparable yield with TPR, if weeds are effectively controlled. DSR does not affect rice quality and can be practised in different ecologies like upland, lowland, deep-water and irrigated areas. It maintains or improves soil health, and increases water-use efficiency. Therefore, DSR can be a technically, economically and environmentally feasible alternative to TPR. A summer mungbean crop can be adopted without delay in sowing of rice crop. It gives grain yield of 8-10 q/ha and usually adds 40-60 kg N/ha in soil, reducing the requirement of N of the subsequent crop. For brown manuring, rice is sown in lines with a seed drill and Sesbania (Sesbania aculeata L.; Dhaincha) is broadcast on the moist soil. Sesbania plants are allowed to grow with rice for 25-30 days, and then, knocked down by applying 2,4-DEE @ 0.50 kg/ha or bispyribac-Na @ 20-25 g/ha. Bispyibac-Na is broad-spectrum and more effective than 2,4-D. Sesbania while growing with rice smothers weeds, reduces herbicide use and irrigation water, and supplies 15-20 kg N/ha with a fresh biomass of 10-12 t/ha. It facilitates better emergence of rice where soil usually forms crust, conserves moisture with brown mulch, improves soil C content and increases farmers’ income. 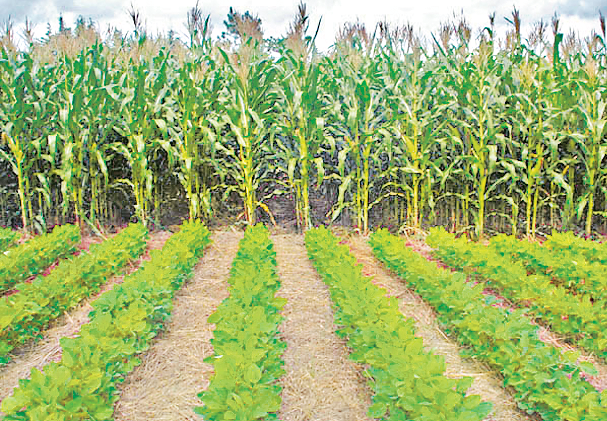 This practice can be followed in crops like maize, pearl millet, sorghum. In broad-leaved crops, 2,4-D cannot be used, but Sesbania can be cut manually and spread as mulch between crop rows at 25-30 DAS for controlling weeds, and conserving moisture and nutrients. Under no-till/zero till (ZT) system with residue retention, soil is not ploughed, but disturbed to the smallest possible extent, and crop seeds are placed into soil by a specially designed seed drill, turbo seeder/happy seeder. At the time of seeding, fertilizers are simultaneously placed beneath the seeds. Both kharif (e.g. maize, pearl millet, sorghum, soybean, mungbean, pigeonpea) and rabi (e.g. wheat, gram, mustard, lentil) crops can be sown using ZT. It reduces soil erosion, compaction and organic matter loss; saves energy/fuel, time and money (~Rs. 3,000-4,000) for land preparation; advances wheat sowing by 10-12 days through direct drilling of wheat sooner after rice harvest (5-10% yield advantage), and reduces wheat yield losses caused by late sowing in rice–wheat system; reduces weed infestation particularly, Phalaris minor in wheat; prevents wheat crop from lodging at maturity; and provides opportunity to escape wheat crop from terminal heat stress. Besides, water requirement is reduced at later crop growth stages by 1-2 cm per irrigation, and weed infestation is reduced over time. In this technique, crops are sown on raised beds (narrow or broad) alternated by furrows, using a bed planter. First, the beds are made after tilling soil, and the same beds can be used for subsequent years, but reshaping of beds are required once in a year, preferably before kharif crops. Beds have width about 60-100 cm. Crops are sown in 2-3 rows on the beds and irrigation water is applied to the furrows. As a result, weed populations are reduced on the top of beds. The furrow irrigated raised-bed system (FIRBS) of wheat usually saves seed by 25-40%, water by 25-40% and nutrients by 25%, without affecting the wheat grain yield. Further, it reduces lodging owing to less physical contact of irrigation water with wheat culms, and vacant spaces in the form of furrows, facilitating easy air movement. Bed planting can be adopted in other crops like cotton, pigeon pea, maize, soybean, vegetables, sugarcane etc. History repeats itself. We witnessed a change/shift from organic to inorganic agriculture, and now, thinking a move towards organic again, similarly, earlier no-till system to excessive till system, and from there to again no/minimum tillage. Definitely, conservation agriculture has potential to improve the use efficiencies of natural and man-made resources, carbon sequestration and soil health (physical, chemical and biological). It improves the sustainability of agriculture by mitigating GHG emission and adapting to climate change. However, the utilization/ exploitation of the CA practices needs to be optimized across locations, crops and cropping systems based on sound benefit-cost economics. It needs interventions at all levels: by farmers, researchers, extension personnel and policy makers to analyse and understand how conservation theologies integrate with other technologies that promote CA. It is, therefore, a challenge for both the scientific community and farmers to overcome the past mindset and explore the opportunities that Conservation Agriculture offers for sustainable agriculture.